Plus, redo your Skill Panel at the church. 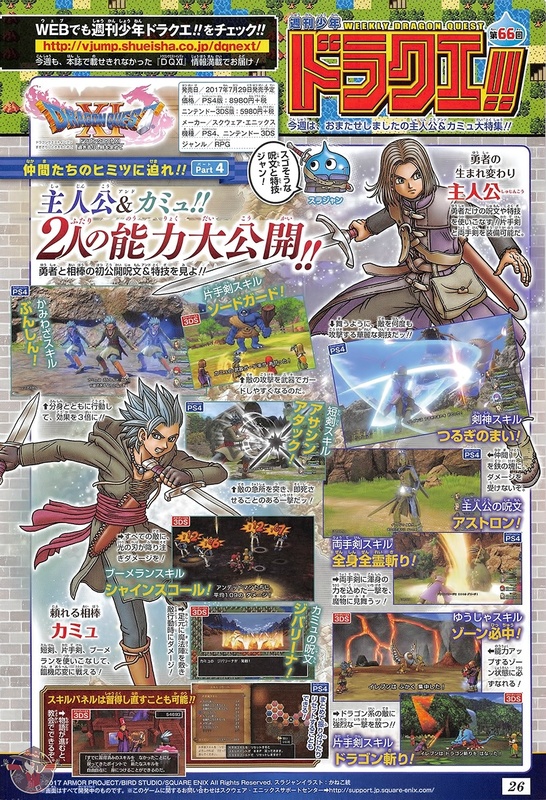 The latest issue of Weekly Jump has new information about the protagonist of Dragon Quest XI: In Search of Departed Time, as well as party member Camus. The protagonist can use spells and special skills unique to a hero. He can equip both a one-handed sword and two-handed sword. “Sword Dance” – A sword god skill in which the protagonist attacks the enemy many times over as if he’s dancing. “All-Out Slash” – A two-handed sword skill in which the protagonist hits the enemy with a blow from his sword that has all of his power put into it. “Zone Hit” – A hero skill that guarantees the protagonist will enter the powered up Zone state. “Dragon Slash” – A two-handed sword skill in which the protagonist unleashes a strong blow to enemies of the dragon family. “Kaclang” – Turns one ally into iron and makes them invulnerable to damage. Camus can use daggers, two-handed swords, and boomerangs, allowing him to adjust how he fights based on the situation. “Clone” – A divine skill that triples Camus’ effect by creating two duplicates. “Sword Guard” – A two-handed sword skill that allows Camus to easily guarding from an enemy’s attack with his weapon. “Assassin Attack” – A dagger skill in which Camus thrusts at the enemy’s vitals for an instant death. “Starburst Throw” – A boomerang skill in which blades of light rain down to attack every enemy. “Jibariina” – Spreads out a magic circle that damages enemies when they perform actions. The magazine also reveals that by progressing through the story, you will be able redo your Skill Panel at the church. You will be able to distribute multiple points at once or do a reset.